Halloween is hot on our heels! Front porches and doorways are decorated with creepy goblins, spooky ghosts, and hissing black cats. Indeed, it seems it wouldn’t be Halloween without those iconic image of a black cat, arching its back and fluffing out its tail. Yet, does it ever make you wonder why cats do that? The black cats with arched backs and bare fangs that you usually see on Halloween merchandise at this time of year are exhibiting fear displays. 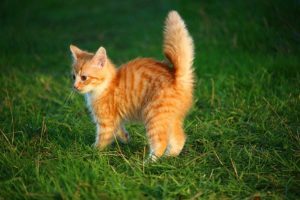 A threatened cat will try to look bigger by puffing out the tail, arching the back, and turning to the side, This will often be accompanied by hissing and spitting, and a cat experiencing this level of fear or anxiety is likely to scratch or bite. While petting your cat’s back, you may have also noticed that his or her back will arch affectionately. This is because cats mostly use body language to communicate. An arched back, a purr, and slowly closing eyes usually indicate that you’ve found a spot where you cat enjoys being petted. Another reason your cat may arch his or her back has to do with stretching. Just like humans, right before a cat settles down to sleep, or as soon as he or she wakes up, a good stretch is in order. Cats will usually arch their backs first, and then walk forward a half step, extending the back and hind legs in the process. Do you have any photos of your cats mid-stretch or dressed up for Halloween? Show us on Instagram! We’d love to keep in touch. Photo by macyvi on pixabay.